AUTO REVIVE MAINTENANCE OR PRESALE DETAIL. • Wheels cleaned and polished. * Exterior rubber and plastic trim restored. * Exterior paint clean and and machine wax polished. (Clear Coar Safe. * Exterior Glass treatment (see better in the rain. * Carpets, seats, mats & boot vacuumed, shampooed and deodorized. * Leather cleaned and reconditioned. * Door jambs cleaned and rubber & seals treated. 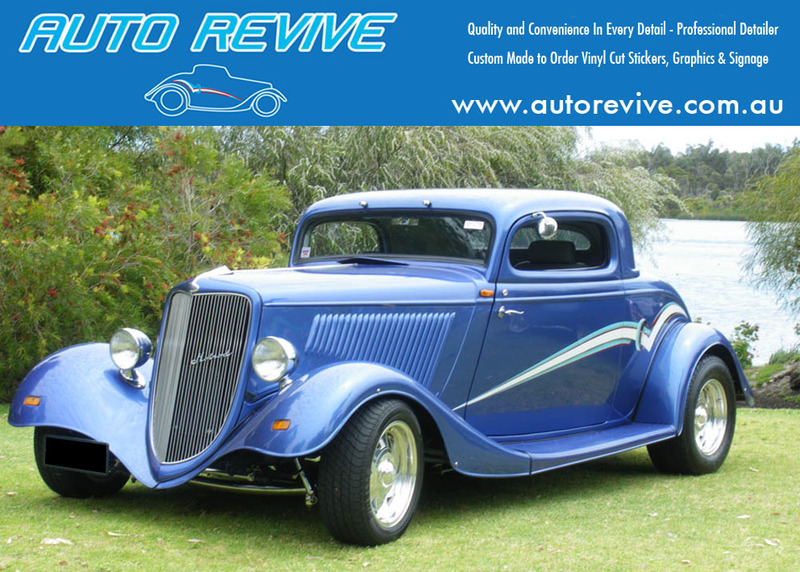 (Suits cars that your Selling or want to Maintain at there best . Takes 4- 5 hours. and is ready for application of Real Carnauba wax application for a deep gloss and protection. Auto Revive Clay Bar Treatment safely removes these contaminants from the paint and leaves your vehicle feeling slick and smooth. There’s no need to compound to remove overspray, bugs, or tar – removes it all! Interior Detail – New Car Feeling! Our interior services completely rejuvenate your interior. This service ranges from the carpet, floor mats, and seats being spot cleaned, to thoroughly shampooing with a powerful hot water extractor that not only melts away stains and eliminates odours, but extracts (rinses) the dirt away. Leather seats and other leather surfaces are cleaned and conditioned to maintain their look and texture. All plastic and vinyl is thoroughly cleaned, then appropriately dressed to prevent cracking and fading. The dash is cleaned paying special attention to cleaning out all of the recessed areas of dust and grime. The result is a spotless, fresh interior that looks and smells new. * Carpets, seats and boot vacuumed, shampooed and deodorised. * Leather interior cleaned and; conditioned. * All vinyl, leather, and plastic surfaces are hand cleaned with our unique cleansers and conditioners leaving a non-oily protected surface. * Exterior paint clean and and machine polished. * Minor Scratch and swirl Removal. • Microfiber towel dry • Wheels cleaned and polished. De grease mags, tyres, under guards, Pressure clean wheelsand; tyres, under guards, sponge excess brake dust & chrome exhaust tips, pressure clean car, gently hand wash entire car, clean glass exterior. side steps, bull bar , bug squash sprayed and pressure cleaned , Pre rinse foam bath, pressure clean car , gently hand wash entire car, pressure wash suds off, chamois dry, tar removed, machined buffed using a cleaner wax machine buffed again to eliminate swirls and holograms, then final carnauba wax wax treatment for gloss and protection. De grease mags, tyres, under guards, Pressure clean wheels & tyres, under guards, sponge excess brake dust & chrome exhaust tips, pressure clean car, gently hand wash entire car, clean glass exterior. side steps, bull bar , bug squash sprayed and pressure cleaned , Pre rinse foam bath, pressure clean car , gently hand wash entire car, pressure wash suds off, chamois dry, tar removed, machined buffed using a cleaner wax machine buffed again to eliminate swirls and holograms, then final Carnauba wax wax treatment for gloss and protection. This intimate detail is for the auto enthusiast who owns a classic or prestige vehicle. 2. To note concerns/issues that the owner may have with the vehicle. • what is a Clay Bar Paint Treatment? After a vehicle has been thoroughly washed and all dirt has been removed from the paint, a clay bar will remove the embedded dirt and other materials stuck in the clear-coat of your vehicle. Driving down the road or even just sitting in a parking lot, a vehicle is always exposed to extremely small particles of dirt that are trapped in the air. Over time these dirt molecules collect on the paint and penetrate the clear-coat of your vehicle, which cannot be washed off through regular wash methods. So once the vehicle has been thoroughly washed to remove the initial layer of dirt, and then clay barred to remove the dirt embedded in the clear-coat, the surface is now as clean as can be and is now ready for the ultimate shine, which can only be produced through car paint polishing. Add this service can be added to a Deluxe detail and receive 10% discount.